Bridal jewellery photos always leave us awestruck. From elaborate necklaces, raani haars, vintage naths and oversized maangtikas…it’s hard to take our eyes off it all. And our real brides sure are giving us all the reasons to spend hours just scrolling through posts by various photographers. Here are 25 photos of brides who wore the most gorgeous bridal jewellery. You’ll love ‘em all, we swear! The polkis and kundans look so beautiful against her gorgeous red blouse!! ... And we can’t take our eyes off her! Ever seen anyone look so stunning?! 4. The bride who gave us some major nath goals! Also that choker is not to be missed! 5. The bride who showed us what an oversized maangtika can do! Those green emeralds are just the prettiest ever. It’s definitely the prettiest hair accessory EVER! That picture truly is breathtaking. 8. The bride whose earrings just stole the show! 9. The bride who had the sweetest smile and the most fabulous nath! Now that picture is worth a million bucks! And a gorgeous maangtika and chaandbalis, and a nath! Don’t miss the pretty colour combination of that lehenga! Don’t miss her cocktail ring guys! 13. The bride who left us mesmerized! Because that hint of colour in that neckpiece is totally killing it! 14. The bride who showed us what ‘statement jewellery’ actually looks like! Everything looks so royal and so well put together. Hard to scroll further down? Yeah, we get it! … And we’re left speechless! 18. The bride who showed us the most gorgeous pair of chaandbalis! 19. The bride who added a hint of purple to her look and nailed it! Also, her double jhumkas are just the prettiest ever! And all brides-to-be should totally take note! And made our jaw drop! 22. 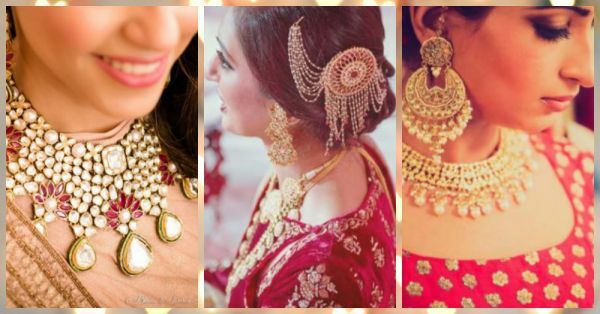 The bride who painted the most glamorous picture with her jewellery and the outfit! And we love those rubies… See what a hint of colour can do for your bridal look? Pearls, and red and green beads… how pretty! 24. The bride who layered like a pro! And each of her jewellery pieces is absolutely stunning! Love those big green stones too!! From the unique design to the pearl drops, we love it all!